First came a poem on the scandal of British MPs' expenses. Next was a tribute to the men who fought in World War One, after the deaths of the last two British soldiers to live through the conflict. 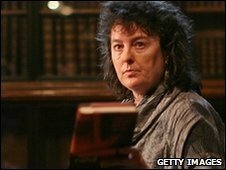 Now, poet laureate Carol Ann Duffy has penned a poem with the perhaps unusual inspiration of David Beckham's Achilles injury. The work is entitled Achilles and mixes references to the ancient battlefield hero with allusions to battles on the football field and to Beckham himself. The cross-over was very apparent to a woman who admits to being a big fan of the game. Myth's river - where his mother dipped him, fished him, a slippery golden boy flowed on, his name on its lips. "He (Beckham) is almost a mythical figure himself, in popular culture," the poet told Radio 4's The World At One. "People, like Beckham, in their public lives are stories the rest of us follow. "It's fascinating that the injury takes its name from Achilles... The whole point of Greek myths is the combination of triumph and tragedy that we follow in them," she added. According to ancient Greek mythology, Achilles was the greatest warrior in the Trojan war. The myth held that he was made invulnerable by being dipped in the waters of the River Styx. But, because he was held by the ankle, his heel remained unprotected and became his only weakness. This is where the notion of "having an Achilles heel" comes from. The impact of Beckham's injury, which has ruled the former England captain out of this summer's World Cup, moved Duffy greatly. "In many ways he's very human, and the interesting thing about taking ordinary people with a particular talent and making them into heroes is when they are seen at their most human," she said. "The most tragic image was him being unable to walk and crying on the side of the pitch. "You just thought how all the money in the world and private planes can't sort this. It was a very moving moment." The 34-year-old footballer has since been treated by a Finnish ankle specialist and is expected to take at least six months to recover from the injury. This is not the first time Beckham, well-known for appearing in glossy fashion magazines, has crossed the divide into the arts. An hour-long video of the former England captain, which simply showed him sleeping, was a star attraction at the National Portrait Gallery in 2004. So far there has been no indication of what he makes of the poem - and the poet laureate admits that she is not expecting to hear from him. "I'm a lot more likely to watch football than he is to read poetry!" she told Radio 4.